The bronze Wishbook was installed in the center of the Republic Square in Alma-Ata, last Friday, a copy of the one that had disappeared on October 7. 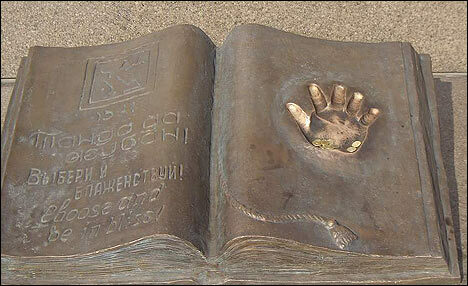 Imprint of President Nursultan Nazarbayev's palm on the open page of the bronze book is all the exhibit was famous for. As indicated by the title, one had to touch the imprint to have his or her dearest wish come true. The Wishbook was regularly visited by newlyweds. The Wishbook disappeared from its place at the foot of the Independence Monument during the City Day celebration. How the thieves pried loose the welded exhibit weighing 80 kg is anybody's guess. Law enforcement agencies suspect that the Wishbook was stolen by nonferrous metal collectors. It goes without saying that the police sprang into a burst of activity (the exhibit is associated with the president, after all) with nothing to show for the effort. A poster proclaiming restoration of the exhibit appeared on the site the day following the theft, but the damage-containment effort of the authorities was frustrated by the Internet. All of Alma-Ata knew what had really happened. The authorities had a copy promptly made and installed - and posted a police cruiser nearby. 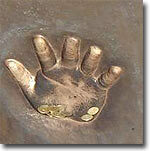 The Wishbook is not the only place in Kazakhstan where Nazarbayev's palm is seen. His arm is visible on every banknote of over 200 tenges ($1.5). When President Vladimir Putin was visiting Astana, he was taken to see the Wish Machine which obediently played the anthem in response to his touch. When Minister of Culture Mikhail Shvydkoi followed suit, however, the machine remained stubbornly silent. It generated the rumors among the locals that the contraption must have a human operator deciding who deserved to be treated to the anthem - and probably had his orders concerning what to decide at that. 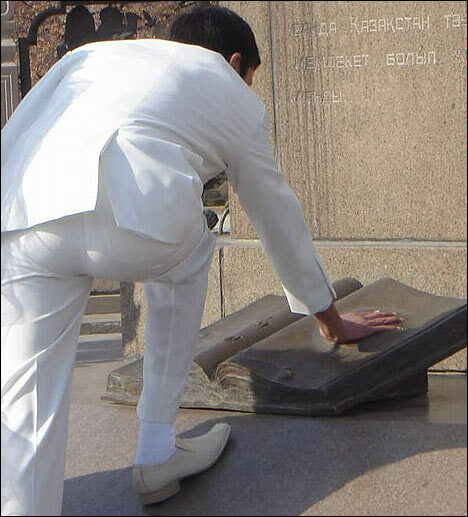 Theft of the imprint of Nazarbayev's palm in the meantime is not the only nuisance associated with the president and the central square of Alma-Ata all at the same time. The square owes its fame to the events of 1986 that are now officially interpreted in Kazakhstan as the first uprising of the Kazakh youth against Moscow's communist dictatorship. The part Nazarbayev played in these events is quite controversial. Official myth-makers claim that Nazarbayev personally led the uprising. Witnesses and participants on the other hand maintain that Nazarbayev was either among the hard-liners who insisted the crisis resolution by sheer strength of arms or that was himself the organizer of the uprising with which he hoped to topple Dinmuhammed Kunayev, First Secretary of the Central Committee of the Communist Party of the Kazakh Soviet Socialist Republic. In any event, the Independence Monument the missing Wishbook was an element of is a reminder of these events. A monument commemorating the 15th anniversary of the uprising was installed there about a year ago but the sculpture (woman with outstretched hands) began falling apart even before the solemn opening ceremony Nazarbayev himself was to attend. The hand that fell off was patched back to its rightful place but the president was respectfully advised to miss the ceremony all the same. General public in Alma-Ata and particularly the national-patriotic forces openly sneer at both episodes. Construction of a vast entertainment complex under the square began a year ago, and general public took it as an affront and sacrilege. In any case, all of that indicates a weakness of the state ideological machinery that never hesitates to replace one official myth with another. That's essentially happened after the theft of the Wishbook that was expected to reinforce the faith of the population in the president's arcane abilities.